Purple Iris Perspective: Start the New Year by Getting Organized! I have always been an organizer and have this ability to just visualize a space and then make the most out of every inch of it. My family typically calls on me whenever they need something organized or well-packed in a box. I think this uncanny ability stems from not liking clutter. Not only does clutter look bad, but my brain tends to reflect its surroundings. If my environment is cluttered, then so are my thoughts, making it difficult to focus on anything. Even my files were horrendous and have been since we moved into this house a few years ago because I just threw everything haphazardly in boxes and said I would deal with it later. Actually, that's what I did for the last few moves that have occurred during the past seven years (sshhh...don't tell anyone). So I knew it would be a monumental task and was able to fool my brain for a time since everything was hidden in boxes, but no more! Yep, my brain finally caught on to my little game of "out-of-sight-out-of-mind." It kept nagging me about how everything is so disorganized, saying, "And, YES, I know all about those papers and junk you've got thrown in boxes, so don't think you're fooling me!" So, naturally, I had to do something if I wanted my brain to shut up about it and get back to thinking more clearly for this new year's projects that lie ahead. It has taken me the better part of a week to accomplish, but I'm finally down to the nitty gritty...the last bit of filing (the stuff I need new folders or binders for). I'm determined to keep going until it is COMPLETELY done! Just seeing how everything is looking so good as I go through the process of organizing, assigning a place for every little thing, and THROWING STUFF AWAY, is inspiring me to see it through to the end. So, that's what I'm going to spend my Sunday doing -- on top of taking stuff to storage (because that's where it belongs...not in my office) and running a few other fairly quick errands. If I just sit down and do it, I think I should be able to get it done today, but it also depends on how much time I spend running errands. It would sure be nice to start the first work week of the new year with a completely organized office! Anywho, with all of that in mind, I thought I'd share some organizing ideas. One in particular is my favorite...organizing drawers! No more "junk" drawer -- at least not one anyone would immediately recognize as a junk drawer -- and no more digging to find what you're looking for because everything is right there at your fingertips in plain view. How is that possible, you ask? Well, it's simple, really, and they're appropriately called "drawer organizers." LOL Now before you start thinking that you're going to have to spend gobs of money on pre-fabbed drawer organizers, let me just say two words...dollar store! If you're not one to frequent the dollar store, you'd be surprised what all they have there at much better prices than even Wal-Mart. Of course, a trip to the dollar store will only be required if you don't already have what you need lying around the house. That's right, you just might have at least most everything already within your reach; especially if you're one who likes to hold onto things "just in case" you need them later (like yours truly). Yes, those of us who think "just in case" frequently find ourselves dealing with clutter "just because" we don't throw things away. 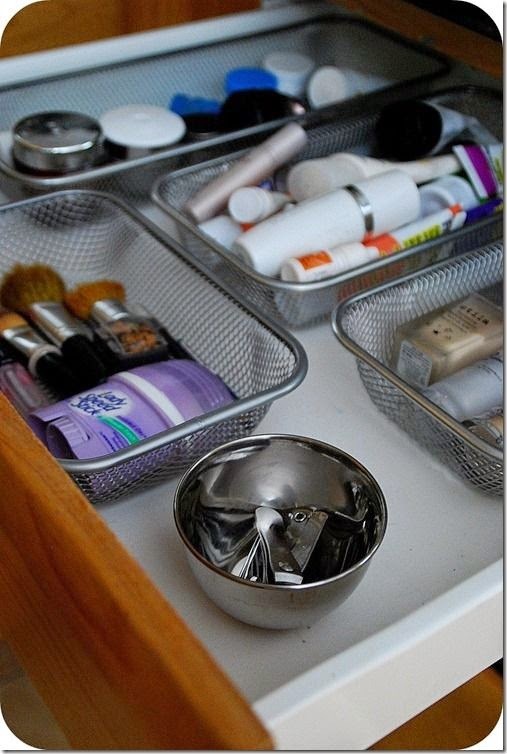 Well, now is the time to make use of some of those things, converting them from clutter to drawer organizers! Got shoe boxes? Checkbook boxes? Small bowls (tin, glass, plastic, ceramic, etc.) or old square cake pans you never use for food anymore? Collect glass bowls to the point where you don't have enough room to display them all like me (yes, I have a weakness for collecting old dishes)? What about cookie tins or other decorative tins? There are a lot of different things you could use and you could even decorate them yourself if they're just plain Jane or too ugly by themselves. If you don't feel like taking on a crafting project and don't have anything that you'd like to see on a regular basis in your drawers, then you can simply head to your local dollar store and buy some cheap bowls and trays to use -- along with some velcro. The velcro would be for keeping the bowls and trays in place when opening and closing the drawers. That way things aren't getting thrown around and possibly being dumped over, totally defeating the purpose of having them in there. If you don't mind a simple crafting project, you could use things like fabric, wrapping paper, adhesive paper drawer liners, etc., to decorate the bowls and trays to suit your taste. You can do all this without spending a lot of money, if any at all. To help you get started, I've provided some images and brief instructions below to give you some ideas about what you can do to organize your drawers. You could even take those ideas and translate them to work for organizing your closet, shelves, or cabinets. For example, I love using old decorative hat boxes to organize things in my closet. They're pretty and stackable and you can even slide them on the shelf under your top row of clothes. The following images show you how to use metal mesh baskets and tin bowls with velcro. Of course, this will also work with plastic, glass, or ceramic containers, bowls, and the like, as long as the bottom rests flat on the surface so the velcro makes contact. Later in the week, I'll share some other nifty ideas for organizing your drawers, closets, cabinets and even your desk top/office, but this should be a good place to start.